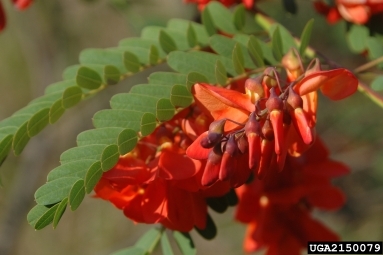 Sesbania punicea is a deciduous shrub or small tree, up to 4 meters tall. It has 10-20 cm long compound leaves each with 10-40 small dark-green leaflets in opposite pairs. Each leaflet is oblong and ends in a tiny pointed tip. The showy coral or red flowers appear in spring and early summer in dense sprays (up to 25 cm long) that droop or project outwards. The 2-3 cm long flowers are shaped like pea flowers. A characteristic feature are the seed pods, which are longitudinally 4-winged, oblong, 6-8 cm long, 1 cm broad, borne on short 1.5 cm stalks and may be dispersed by water. The tip of the pod is sharply pointed. The 4-10 seeds are separated by partitions and are freed only when the pod eventually breaks open. The legume genus Sesbania includes a number of annual and woody species, many of commercial value. U.S. Habitat: Thickets, marshy shorelines, disturbed areas. Distribution: Found locally in the southeastern U.S., from Virginia south to Florida and west to Texas; also in California. Young plants of Sesbania punicea can be pulled by hand or with a weed wrench. The root system is not very large, especially in waterlogged situations, so pulling is relatively easy. Larger trees can be cut, and the stumps should be treated with triclopyr. Flooding is not effective, but trees standing in water could be cut below the water line (without an herbicide application). Glyphosate has been used unsuccessfully in Florida when used alone (1%, as a foliar spray) and with triclopyr (1% Glyphosate, 1% triclopyr). Trees in California sprayed with glyphosate have responded with yellowed leaves, but the overall efficacy of this method has not yet been determined (Dempsey, 2001). Three biocontrol agents are used against S. punicea in South Africa.